New York is known for what seems like a natural tendency to want things done quickly. This collective attitude may be perfectly normal, when considered from the perspective of an overall environment that’s fast-paced, hectic and characterized by constant hustle and bustle. Of course, such a lifestyle wants to limit the amount of time that is wasted doing anything. This guide provides an overview of New York public records resources with the hope that saves people time. Statewide birth, marriage and death records for events that happened outside Big Apple borders are maintained by the New York Health Department Vital Records Section. Likewise, all statewide divorce records for events that occurred ever since 1963 are on file at the Vital Records Section. Qualified applicants may obtain certified copies of these documents, while non-certified copies and older certificates are available to all desiring genealogy researchers. Birth and death certificates are also issued by local County Registrars and marriage records are maintained by the City or Town Clerk Offices that issued the license. In some cases, the local county office maintains a website where you can order certificates. In other cases, you will need to physically visit or call the office in the county you are interested in to get access to records. To find public records of any kind in the Big Apple, visit the official New York City Department of Records website. They have digital archives of historic photos, government publications, and lots of other valuable NYC records. Real Property Tax Offices located in each New York County maintain public records that pertain to personal and real property taxes. Most Real Property Tax Offices provide the public with access to online databases that are searchable by owner name, property classification, street address, tax valuation or plot map ID number. Property tax records that aren’t available online can be requested by mail, phone or in-person at the appropriate NY County office. 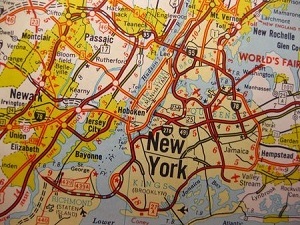 New York provides a centralized online database with statewide DMV records for easy public access to request various driving-related documents. You may obtain general information regarding DMV records and official driving record abstracts, as well as your own lifetime driving history or vehicle and title record abstract. VINElink is an e-vendor that provides the general public and crime victims who reside in various states with a centralized virtual source to locate county jail inmates. You may find potentially vital public safety data pertaining to inmates lodged at 60 different local County Correctional facilities located throughout New York State. The New York Dept. of Corrections operates an online centralized database with statewide inmate records that’s searchable by the subject’s name or DOC ID number.